April 4, 2019 – As we conclude the year-end push for departments across the college to order print and promo items and secure advertising commitments, Communications & Creative Services would like to honor a behind the scenes hero in the Purchasing department. Congratulations to program assistant Heather Domin, Brand Ambassador for March 2019. Heather Domin, the March 2019 CCS Brand Ambassador of the month. Communications & Creative Services (CCS) is the official proof approver for Santa Fe College. As such, all proof approvals, including reorders and final proof approvals must come through communications@sfcollege.edu. All art must be original art provided by CCS and must not be altered. Any alterations will be done by and provided to the vendor by CCS. If art is being digitized and converted for embroidery, a sew/stitch out must be provided, and not a digital representation. Photos of the sew/stitch out will be accepted for proofing. Any questions, please reach out to communications@sfcollege.edu or 352-395-5235. 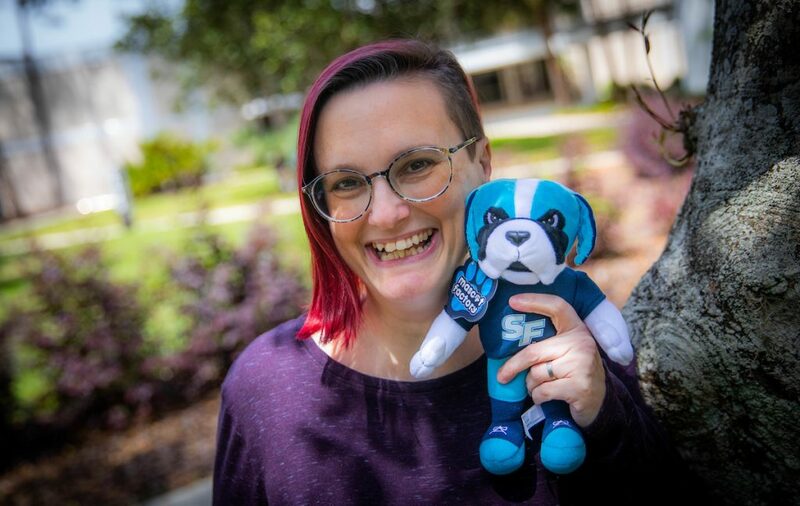 In addition, as a web editor for her area of the college website, Heather consistently keeps her pages accessible and her information current. She’s worked with web designers in CCS to curate large amounts of technical information into a user-friendly format.